Visitors to K 2013 will obtain information about high-end EXTRUDEX extrusion technologies in Hall 16, Stand B 42. In particular, the control unit VR-3, producing automatically a consistent vacuum in the calibration bath of an extrusion line, is a main highlight. Another one is Helibar ®. This single-screw extruder provides immense advantages with regard to energy savings and durability. Tests have revealed: a 10 percent improved energy saving rate compared to state-of-the-art extruders of grooved bushing design can be achieved. By retrofitting older machines with a new process unit (screw/cylinder) keeping the existing gear system/motor, the efficiency rises by 20 percent. Up to 60 percent savings could be achieved replacing the complete unit, i.e. 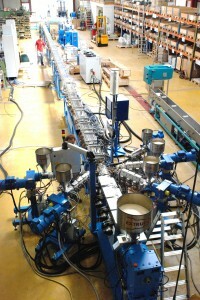 a 90 screw diameter (OD) extruder with a 60 OD HELIBAR®. These exhibits are design components of a five-layer pipe extrusion plant which has been started up at a southern German pipe extrusion plant a few days before K 2013. 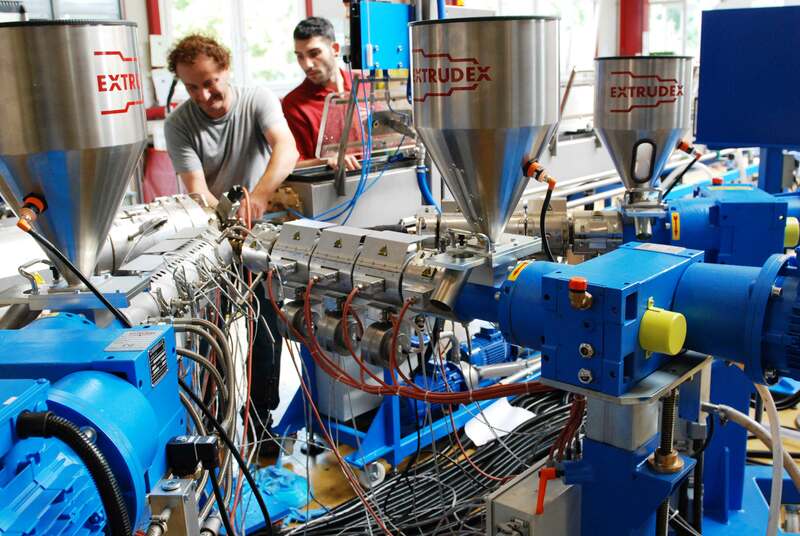 The five-layer pipe extrusion line, developed and produced by EXTRUDEX GmbH, Mühlacker/Germany, is characterised by high production speed and precision. The line has been delivered to customer by end of August and was started production within two days. Not it is used to produce pipes for floor heating systems. These consist of a core pipe layer, an adhesive tie layer, an EVOH barrier layer, a further adhesive tie layer, a protective layer in PE, as well as three stripes. “It began with monolayer pipes earlier, later on 3-layer pipes were introduced into the market, consisting of a core pipe layer, an adhesive tie layer and the EVOH barrier layer. As the outer EVOH barrier layer dissolves easily in water and is very sensitive to mechanical damage, the EVOH barrier layer was moved to the interior of the pipe, and this is how the 5-layer pipe arose”, EXTRUDEX’s Managing Director Helmut Wahl explains. The newer pipes even have internal protection for the EVOH barrier layer: this makes them even more secure and better sealed, so that no osmosis is possible. Wahl adds: “the five-layer pipe produced with our line meets the specific needs of the industry and is used as a high grade product for heating or cooling systems. It also finds use for wall heating”.RT 2344, 2388 or DX800 grades of PE materials form the basis for the pipes. Six extruders in the line produce the final finished pipes in diameters from 16 to 25 mm. “We have to respect layer thicknesses and tolerances on a micrometre scale”, Wahl stresses. The extruder applies and evenly distributes finest layers. The 16×1 and 17×1 mm [16 mm & 17 mm diameter, 1 mm wall thickness] pipes are produced with a speed of 30 m per minute in the required dimensions and tolerances. An ultrasonic measurement head measures the overall wall thickness inline, while an X/Y laser head controls the outer diameter. The fully automatic VR-3 vacuum calibration control unit ensures constant vacuum in the calibration bath. “The line is efficient, because it is so precise and fast”, says Managing Director Wahl. During last three years, the company in Mühlacker/Germany has delivered seven similar lines to its customers. EXTRUDEX has been developing its own programme of multilayer tool heads for the past seven years and using them very successfully in various application areas. Tools are made out of highly alloyed steels. Until product corresponds with prescribed dimensions such as outer diameter, layer thicknesses, ovality etc., line has to be started up manually. During the next step, production speed is synchronised within the line control system, which then ramps up the entire line to the required extrusion speed. Monitoring and regulation of the entire line takes place in a central control sys-tem. “Each single extruder can be controlled individually, which is very important, especially, as explained, during start-up of the line. Production only commences when the pipe has been shown optimal performance following measurement after the last cooling bath”, Wahl explains. With six extruders, the calibration and the three spray cooling baths six metres each, the entire line measures 35 metres. Individual components of such a line, such as e.g. a multilayer die head, the control system, a vacuum calibration bath, a HELIBAR extruder, the VR-3 control system or also smaller extruders, will be exhibited at K 2013. “With 30 metres/minute guaranteed speed, with somewhat more still achievable, EXTRUDEX supplies one of the fastest 5-layer lines. 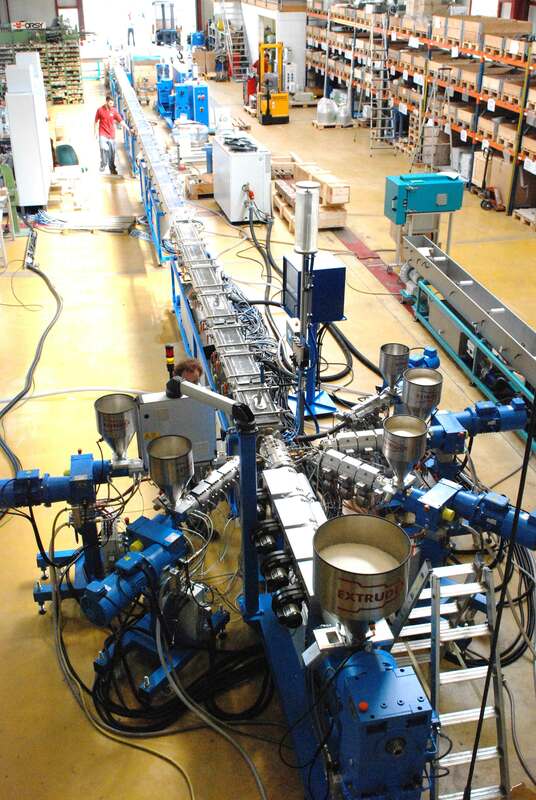 Every metre/minute faster means cash for producer of pipes with our extrusion lines. Everyone can be convinced about this on our stand”, the EXTRUDEX Managing Director proclaims with pride. EXTRUDEX Kunststoffmaschinen GmbH, based at Mühlacker/Germany, was founded in June 1985 by Helmut Wahl. Over the past 28 years, the company has developed to one of the globally leading manufacturers of single screw extruders as well as complete extrusion plants. A dedicated and competent team of 20 employees develops, plans, designs, builds and delivers EXTRUDEX systems to customers worldwide. Among the remarkable new developments is – in particular – the HELIBAR® single screw extruder. The energy balance can – compared with conventional extruders – be improved by 10 to 60 percent, due to the reduced need for cooling and the compact machine design at the same output. In addition, EXTRUDEX GmbH has made a worldwide name for itself for the production of economic and high-precision extrusion systems for automotive and medical device industries.